Saturday night view from my bedroom window. We live in town, which means we live in the center of activity, both good and bad. 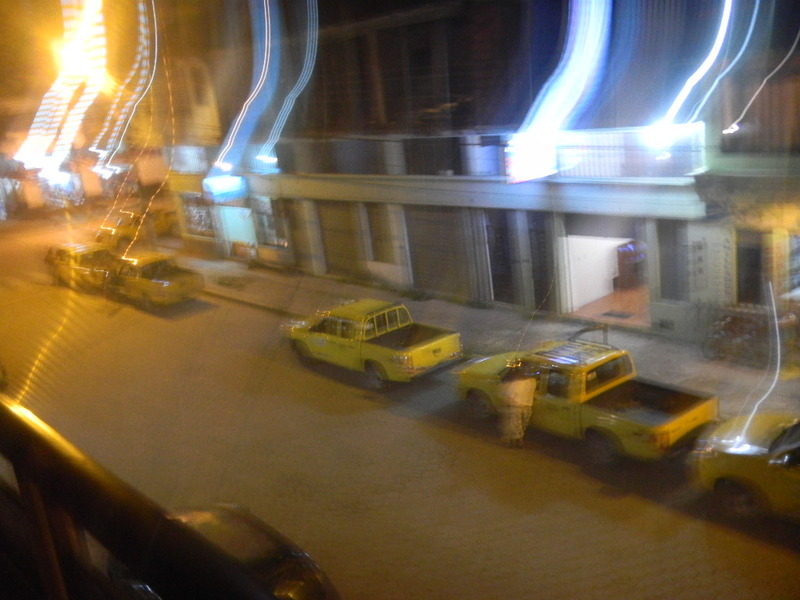 Each evening (especially on Saturdays) the street outside our window is filled with constant horn-honking taxis, carefree (and loud) children occupying the sidewalks with games of tag and soccer, and friendly neighbors sharing laughter with one another. A little later we hear the karaoke bar around the corner. Tipsy voices fill the air off-key singing, cheers rise periodically from a drunken audience, and overbearing background tracks bellow loud enough to drown out the bad singing. The bar to our right sends drunken patrons out into the street in the middle of the night to settle their disputes or continue their revelries. In addition, the startling sounds of unattended car alarms fill our street-ways anytime of the day. Needless to say, it’s rarely quiet around our house. I’m a fan of quiet. In fact, I’ve discovered in recent years that silence and solitude are like fresh air to me. If I’m worried or weary, I simply spend a few hours in quiet solitude and then I’m ready to face life again. Herein lies the problem: my world is polluted with constant noise. Although my noise pollutants are ones that I can’t really control, I’m reminded that there is another noise pollution problem that I can control. Here’s a question for us all: When was the last time we turned of the cell phone, TV, iPod, and computer and simply enjoyed the silence? Why must we be available –by cellphone, Facebook, Skype, home phone, voicemail — to anyone and everyone 24/7? Herein lies our problem: there’s too much permissive noise pollution in our lives. A little research on the effects of noise pollution easily points to the ills of our society. Scientists have proven that noise pollution cause the following problems: hearing loss, stress, high blood pressure, sleep loss, distractions, lost of productivity, and ultimately a reduction of the quality of life. Worst is we are often the ones who allow all manners of noise to take center stage in our lives. After a little more research, I discovered there are ways to control the noise in our lives. While these refer to reducing involuntary noise pollution, they can easily help us find ways to purify the self-permitted sound waves around us. The first is “identify, isolate, and treat the paths the noise will take.” We should all take a moment and determine what noise is necessary in our lives. Must the cell phone be turned on after 9 PM? Do I really need the TV on while I cook dinner? Can I not check my Facebook account every few hours? Now we move on to “reducing noise entering specific places.” Picture this: it’s dinner time and for once the entire family is sitting at the table together. Eager faces eye the buffet before them and thanks is given before everyone digs in. Enter the smartphone, the unwanted guest at every dinner table. He vies for our table guest’s attention and steals their conversation from us. Now instead of sharing our day with the family, we are relegated to a meal void of conversation and bonding. I propose we “unplug” at dinner. No cell phones allowed. The TV must be silent. It’s time for the voices of our family and the clanking of forks and knives to make the music at the table. Finally, it’s suggested that noise pollution can be reduced by “containing the noise at the source.” Find the Source. We must be the determiner of what we will let pollute our personal sound- and brain-waves. Is it the voice of God or is it that new ringtone you just downloaded? Is it the Siren song of Facebook calling you to update your status and investigate all the meaningless activities of friends? Is it the theme song of the latest reality show that glorifies all that is wrong with world? Whatever it may be for any of us, it’s time to get tough with pollution. This time of year is a perfect opportunity to make some changes to how much “loud time” we give. It’s an opportune moment to decide on a little less noise and little more quiet in our souls by spending more time unplugged. This week take a moment and sit around the silent blinking Christmas tree lights and revel in the peace. Jesus entered this world quietly and forever altered the course of history. What can we accomplish with our own quiet? How do you plan to “unplug” during this Christmas season? This entry was posted in Family Life, Spiritual Encouragement and tagged Alicia C. Hall, Alicia Hall, blogger, writer on December 6, 2012 by aliciachall28. Love the article. I never have quiet!! !